The authors of the hit 'Oh My God, What a Complete Aisling' series of novels will host a book signing at Newbridge Silverware this Sunday afternoon, September 23. The pair have just released 'The Importance of Being Aisling - Country Roads Take Her Home', a follow up to last year's hit series debut. 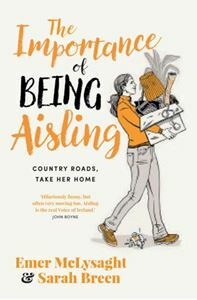 Aisling is the quintessential Irish country girl at large in the big city - the type who organises lists, walks to work in her runners and makes sure everyone gets home safely at the end of the night, and described by her creators as "the type of woman who is keeping Ireland going". The second book in the planned trilogy follows 'Ais' through a major change in her life as she moved back in with her mammy in Ballygobbard. Kill woman Emer and her writing partner Sarah dreamed up the idea of Aisling over a decade ago - and a popular Facebook group of the same name keeps her worldwide community of fans in touch with each other. The writers will be signing books and meeting fans at Newbridge Silverware from 1.30pm to 3pm. Breen and McLysaght will also appear on the Late Late Show this Friday night. It has also been announced that they will take part in this year's Kildare Writers Festival, in conversation with Eithne Shortall in the Riverbank Arts Centre on Friday, October 12.